The Patented USA (Canada Pending) Kibosh Pipe Repair is an instant and simple to use repair clamp for perforated metal, plastic and multilayer pipes. 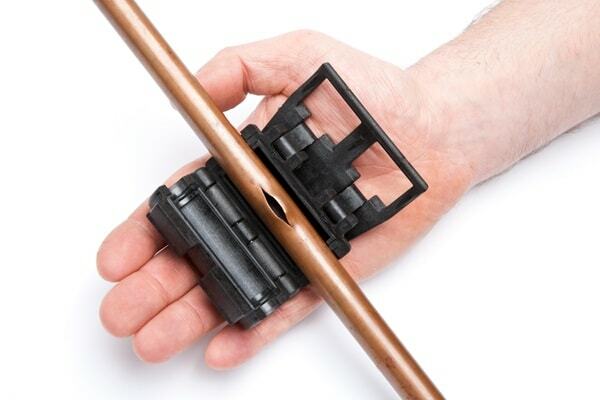 It is re-useable, can withstand 145PSI pressure and can even accommodate some leaking pipe fittings. Once fitted, the pipe can continue to function under normal pressures and temperatures until a permanent repair can be made. Ideal for all trades people; Plumbers, Joiners, Builders, Electricians, Carpet Fitters, as well as maintenance, janitorial and DIY’ers who could perforate a pipe accidentally with a nail, drill, jigsaw or any other sharp power or hand tool. It can also be used by anyone who could potentially have a frost damaged burst pipe! Once fitted the pipe can continue to function normally-hot or cold! You can visit their website to buy one: www.kiboshpiperepair.com. Or you can click the “Check It Out” button below to get yours on Amazon!